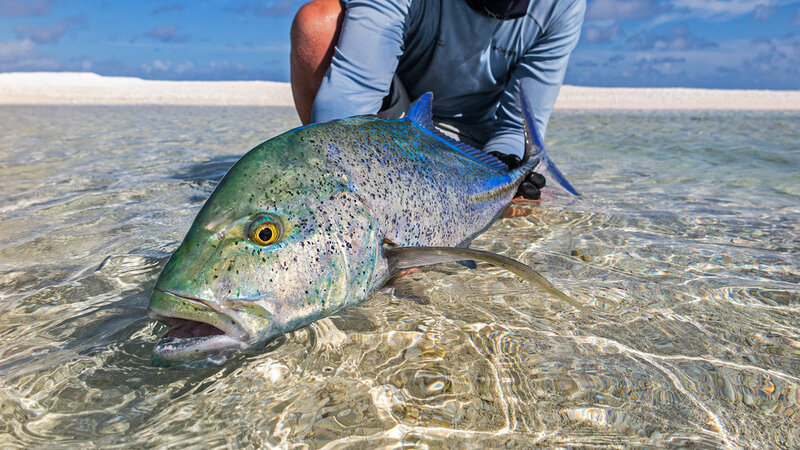 If wading and sight casting to double digit Bonefish, tailing Indo-Pacific Permit and a host of Trevally species on powder white sand flats on an extremely remote Indian Ocean atoll appeals to you then look no further, St Brandon’s Atoll is the destination for you. St Brandon’s (Cargados Carajos Shoals) is a group of over 50 small islands, coral ridges and vast sand flats that extends 50 km from north to south. Situated 268 nautical miles northeast of Mauritius’s main island this area is rich in fish stocks, flora and fauna. Guests will be accommodated in a simple but comfortable guesthouse on Raphael Island situated in the fish rich northern part of the atoll. This most certainly is the most spectacular bonefishing you will ever encounter as on most tides anglers can expect to see shoals of these shallow water speedsters as well as enormous singles and doubles. Over the past few seasons we have landed Bonefish of up to 87cm fork length and weighing 15lbs. LODGING DETAILS: Guests will be accommodated in a simple but comfortable guesthouse on Raphael Island situated in the fish rich northern part of the atoll. 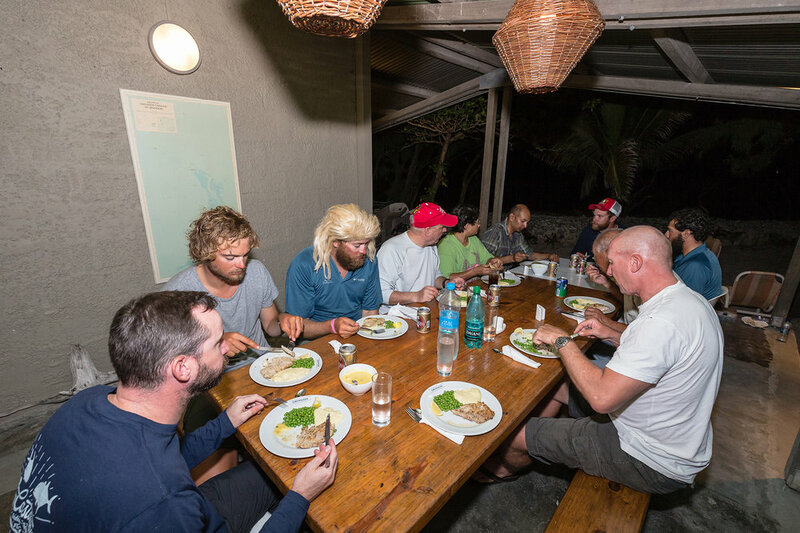 Although the guesthouse is by no means luxurious, it is clean, comfortable and considering it’s remote location, is all a travelling angler needs to enjoy the finest trophy Bonefish, Indo –Pacific Permit and trophy GT fishing available in the Indian Ocean. To top it off, there is a highly productive and easy wading flat just meters away from the front porch of the guesthouse. Currently there are 4 bedrooms in the house, each containing two comfortable single beds and some basic amenities. The guesthouse currently has two fully renovated bathrooms for the guests, each containing a shower, basin and toilet. FOOD & BEVERAGE: Meals prepared by the chef are a mix of Creole and international style dishes. An outside undercover dining area on the waters edge forms an idyllic backdrop for meals when the weather allows. LENGTH OF STAY: The typical lodge package at St Brandon's is a 10 nights/7 fishing day package. 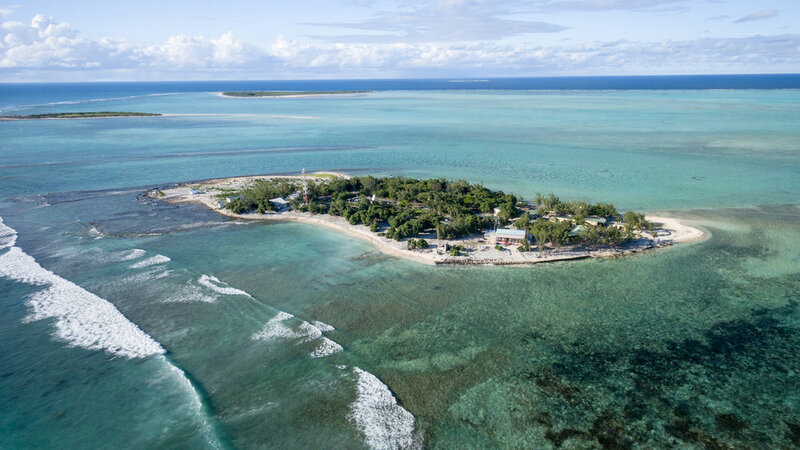 NON-ANGLING ACTIVITIES: St Brandon's Atoll is situated in a the middle of the Indian Ocean, and overall, this is a fishing-focused operation. INTERNET/COMMUNICATION: Farquhar Atoll has telephone and Internet services for guests although the internet speeds reflect its isolation. GENERAL INFO: This most certainly is the most spectacular bonefishing you will ever encounter as on most tides anglers can expect to see shoals of these shallow water speedsters as well as enormous singles and doubles. 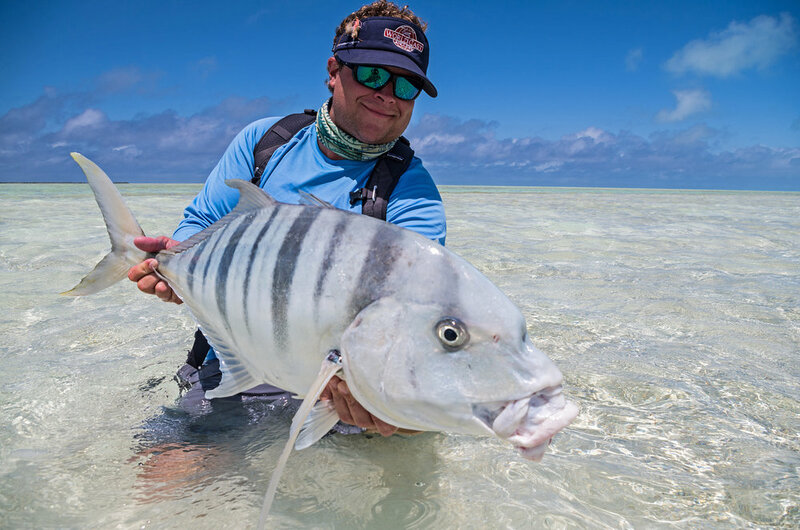 Over the past few seasons we have landed Bonefish of up to 87cm fork length and weighing 15lbs. St Brandon’s is also the most productive Indo-Pacific Permit fishery in the Indian Ocean. When specifically targeting these gloriously finicky fish, guests are afforded multiple shots per day. Over the past seasons our guides have refined their tactics for the Permit of St Brandon’s and enjoy nothing more than watching their clients lean into sizeable specimens. St Brandon’s isn’t a place where anglers are going to get shots at GT’s everyday but it is certainly the place to break the 100cm mark. The fish are all large and you catch more over a meter than under. We have in fact seen and hooked fish well over the 150cm. Large Bluefin Trevally are also around in good numbers and we frequently land fish between 15-20lbs. 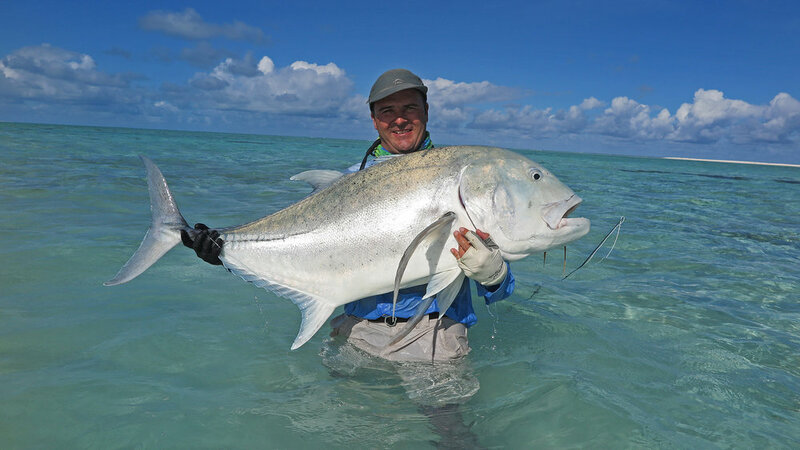 Other notable fish species one can encounter on the flats include Golden, Yellow Dot and Green Spot Trevally. EQUIPMENT REQUIRED: We recommend that each angler take at least three rods, two 9# rods or one 9# and one 10# for Bonefish, Triggerfish, Bumphead Parrotfish & Milkfish and two 12# rods for Giant Trevally, Bluefin Trevally, Barracuda and Bluewater. Please email us for comprehensive tackle details. Guests need to fly into the main island of Mauritius the day prior to departure to the atoll and overnight at a hotel (we will recommend suitable options). ARRIVAL & DEPARTURE DETAILS: Arriving a day earlier ensures that there is a time buffer built in for missed flight connections, flight delays/lost luggage etc. Return international flight can be booked to depart after 20:00pm on the last date of the trip. Two 50ft sportfishers will transport the guests and two of the guides to the atoll, the crossing takes +/-26 hours. September to December and again from April through to June. WHAT'S INCLUDED: Return transport to St Brandon’s from Mauritius onboard 2 x 50ft Sportfishers, 8 nights full board and accommodation at Raphael Island guesthouse based on two people sharing a bedroom, 7 days fully guided fishing (2 anglers to a boat and guide), Fishing licenses, Tender boats & fuel, Soft drinks, water & local beers. WHAT'S NOT INCLUDED: International flights from your home to Port Louis, Ground transfers on Mauritius, Meals and accommodation in Port Louis or any other en route cities, Spirits, wine, items of a personal nature, Gratuities for guides and lodge staff (although gratuities are discretionary, based on international standards guests can expect to pay US600 each for guides and US200 for lodge staff), Travel & medical insurance (medevac insurance is mandatory – we recommend Global Rescue).